Bioinvasions and Globalization synthesises our current knowledge of the ecology and economics of biological invasions, providing an in-depth evaluation of the science and its implications for managing the causes and consequences of one of the most pressing environmental issues facing humanity today. Emergent zoonotic diseases such as HIV and SARS have already imposed major costs in terms of human health, whilst plant and animal pathogens have had similar effects on agriculture, forestry, fisheries. The introduction of pests, predators and competitors into many ecosystems has disrupted the benefits they provide to people, in many cases leading to the extirpation or even extinction of native species. 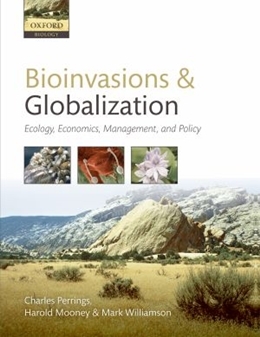 This timely book analyzes the main drivers of bioinvasions - the growth of world trade, global transport and travel, habitat conversion and land use intensification, and climate change - and their consequences for ecosystem functioning. It shows how bioinvasions impose disproportionately high costs on countries where a large proportion of people depend heavily on the exploitation of natural resources. It considers the options for improving assessment and management of invasive species risks, and especially for achieving the international cooperation needed to address bioinvasions as a negative externality of international trade.